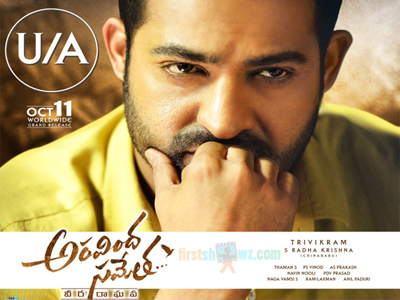 NTR's Aravinda Sametha Veera Raghava has cleared censor scrutiny and has received U/A certification from CBFC officials. The runtime has been locked to 162 minutes. Unlike Trivikram's previous movies, Aravinda Sametha seems to be packed with preferred heavy dosage of action sequences with lot of bloodshed. The film is set in faction backdrop, and it's the story about man's revenge for his father's murder. The second half will be high on emotional content. Aravinda Sametha features Pooja Hegde in female lead role and Jagapathi Babu, Eesha Rabba, Sunil, Naga Babu in key roles. Thaman is the music scorer for this Haarika and Haassine Creations movie directed by Trivikram.